University President Lawrence S. Bacow attempts to quiet protestors before exiting the John F. Kennedy Jr. Forum. 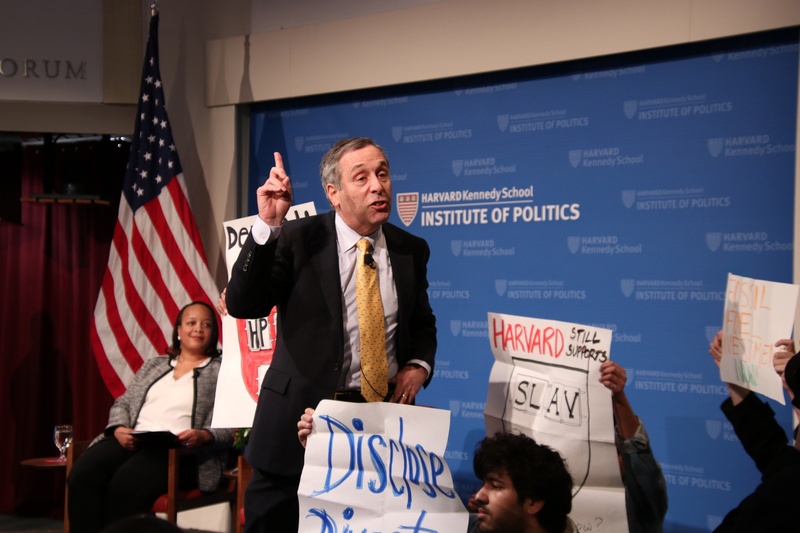 Roughly 30 protestors from two prominent Harvard divestment campaigns interrupted a Harvard Kennedy School event featuring University President Lawrence S. Bacow and Graduate School of Education Dean Bridget Terry Long to continue their calls for fossil fuel and prison divestment Thursday evening. Over the past few months, the two campaigns — Divest Harvard and the Harvard Prison Divestment Campaign — have ramped up their demands for the University to divest its nearly $40 billion endowment from companies related to the fossil fuel industry and the United States prison system. Before the two Harvard administrators — who were slated to discuss how universities can promote economic opportunity — could begin their exchange at the John F. Kennedy Jr. Forum for the Malcom Wiener Center for Social Policy event, protesters within the crowd stood up from their seats holding signs with slogans like “Demand: Divest!” Six protestors took the stage and sat down in front of Long and Bacow. Kennedy School Dean Douglas W. Elmendorf told protestors they could demonstrate but urged them to move to the back of the forum to allow audience members to see Long and Bacow. “I understand that some of you want to make a point, and you can make that point, but I’m afraid [what] you can’t do is to hinder the ability of other people here to listen to our speakers,” Elmendorf said. Elmendorf struggled to quiet the protestors for several minutes, until Bacow stood up and gave a terse address. Bacow also told the protestors he would respond to “reason” instead of “pressure,” reiterating comments he made during a meeting with members of the prison divestment campaign last month. He noted that he was “happy” to meet with them again, but for the sake of those in attendance at the discussion, he planned to continue the event. 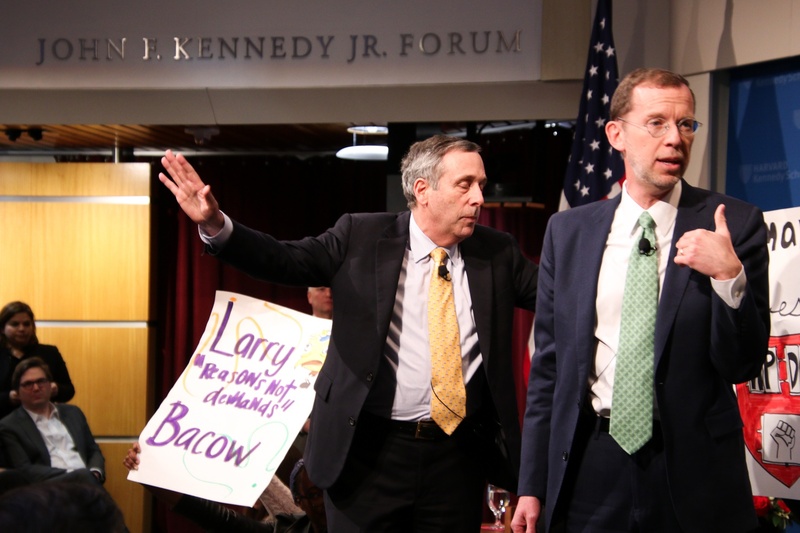 After protestors refused to leave the stage, Bacow, along with Long, Elmendorf, and members of the audience, left the forum to congregate in a fourth-floor Kennedy School classroom to continue their conversation. 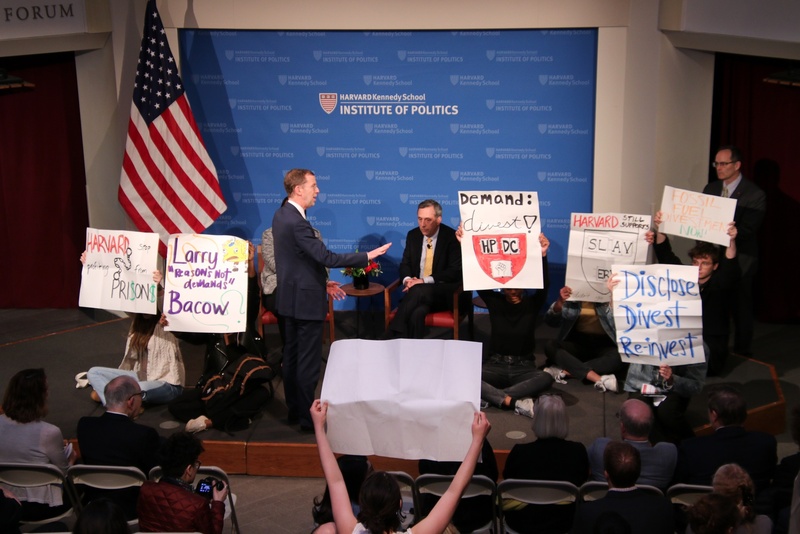 Protestors from Divest Harvard and the Harvard Prison Divestment Campaign interrupt an Institute of Politics event featuring University President Lawrence S. Bacow Thursday evening. Law School student Joanna C. Anyanwu, a member of HPDC, said after the protest that the activists had succeeded in garnering the desired response from administrators. Still, Anyanwu said her group was “open to more dialogue” with Bacow. "He has our information and if he ever wants to talk to us, he’s free to do so,” she said. After relocating, Bacow and Long continued their conversation without further disruptions. In an interview with The Crimson following the event, Bacow addressed his frustrations with the protestors. “If they believe this is the way to persuade people of the rightness of their cause, they’re grossly mistaken,” Bacow said. Bacow also referenced his “multiple” meetings with students about divestment, a trend he said he is now hesitant to continue. 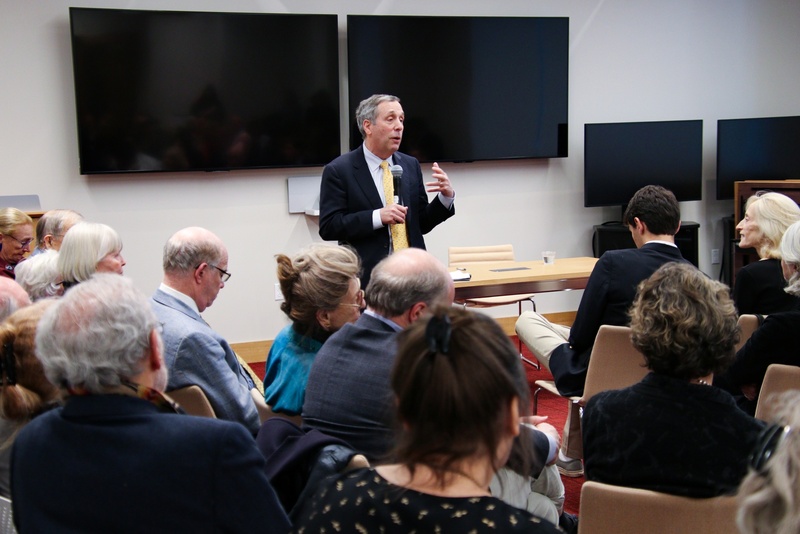 Following the protest, the Institute of Politics event was relocated to a Harvard Kennedy School classroom, where University President Lawrence S. Bacow responded to audience questions about the role of higher education in creating economic opportunity. While Harvard is not a stranger to divestment movements on its campus, the two groups have escalated their efforts in recent months. Both fossil fuel and prison divestment advocates have marched through Harvard Yard, released petitions that have garnered wide-support from Harvard affiliates, and met with Bacow himself. Prison divestment advocates also displayed a banner condemning Harvard’s investments in prison-related companies during a Tuesday gender equity summer where Bacow was speaking. Thursday’s protest, however, marks the first time the groups have come together to demonstrate for their causes. In addition to Thursday evening’s encounter, Bacow’s chief of staff, Patricia Bellinger, wrote an email Wednesday to fossil fuel divestment advocates declining their request that he attend a public forum to discuss Harvard’s holdings of fossil fuel-related assets. His decline comes on the heels of a Tuesday Faculty of Arts and Sciences meeting in which Bacow said he would look into hosting in a forum with professors about the subject. University spokesperson Jonathan L. Swain declined to comment on the call for a student forum, referring to Bellinger’s email. A previous version of this article incorrectly referred to the event as being hosted by the Institute of Politics. In fact, it was a Harvard Kennedy School's Malcolm Wiener Center for Social Policy event. —Staff writers Molly C. McCafferty, Shera S. Avi-Yonah, and Camille G. Caldera contributed reporting. — Staff writer Alexandra A. Chaidez can be reached at alexandra.chaidez@thecrimson.com. Follow her on Twitter @a_achaidez.